Sweden's prime minister has expressed disquiet about Russia's human rights situation after an EU-Russia summit in Stockholm. Fredrik Reinfeldt, whose country holds the EU's rotating presidency, said: "We exchanged views on human rights, the rule of law in Russia and democracy. "This is an increasing cause for concern," he added. Moscow and Brussels are still rebuilding relations after falling out over last year's Georgia-Russia war. EU leaders were also due to discuss key issues such as trade and energy with their Russian counterparts. Russian President Dmitry Medvedev was quoted by Reuters news agency as saying that Russia hoped to complete a new economic co-operation pact with the EU soon. "We are now agreeing the points of the document and I hope we will soon come to finalising the text of this document." The EU was also seeking assurances there would be no repeat of last winter's disruption of gas exports to the West. And Brussels was also inquiring whether Russia was still interested in joining the World Trade Organization. The EU, which represents 500 million people, is Moscow's biggest trading partner and depends heavily on Russian gas. Moscow, meanwhile, is seeking more foreign investment. The BBC's Dominic Hughes in Brussels says Russia's brief but violent war with Georgia still casts a shadow over relations with the EU, particularly those newer members from the old communist bloc. But our correspondent says political reality means both sides have to move on. He adds that underlying the summit is a move towards a new EU strategic partnership with Russia, essentially giving the relationship an upgrade. On Monday, Moscow and Brussels agreed to notify each other in advance of any problems affecting energy supplies, and to work together to fix them. A quarter of the gas consumed in the EU comes from Russia, most of it transported via Ukraine, which has often had fuel disputes with Moscow. In January, Russia cut off gas supplies to more than a dozen European countries for two weeks, amid a row with Kiev. Earlier this week, Finnish Foreign Minister Alexander Stubb said the EU needed to work closely with Russia. "There is a level of mutual dependence - we depend on them for energy supplies and we are energy consumers for them," he said. 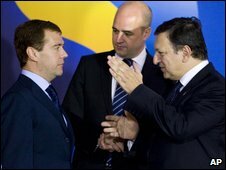 President Medvedev is said to have pleased EU officials with recent comments on modernising his country's economy. Other issues expected on the summit agenda included global warming, security and Iran's nuclear programme.